discovered the new earth from the Bastnäs mine. which Piazzi had named after goddess of golden grain. “Hold it a second,” said Klaproth. praseodymium, neodymium, samarium, and europium. Look for that in your cigarette-lighter flints. as a use for cerium, as well as successful gas mantles. is used in aluminum and iron alloys. and its hot gases are toxic. produce different patterns of sparks. are fragments of burning cerium. Wilhelm Hisinger was the first to observe that during electrolysis an element migrates to either the cathode (negative) or the anode (positive). 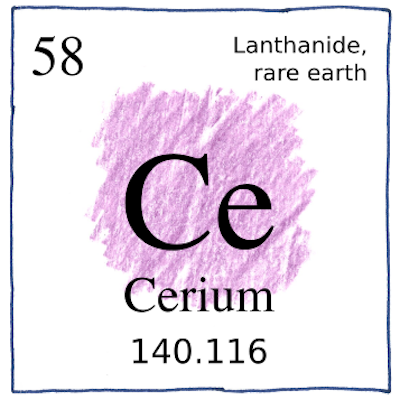 Cerium is electropositive; it migrates to the anode.